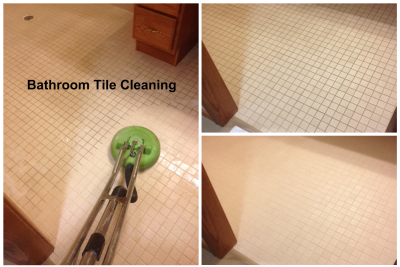 NEW Solid Surface Cleaning can clean your tile and grout floors like never before. Do you remember how bright, shiny and clean your tiled floors looked when they were new or when you moved into your home? 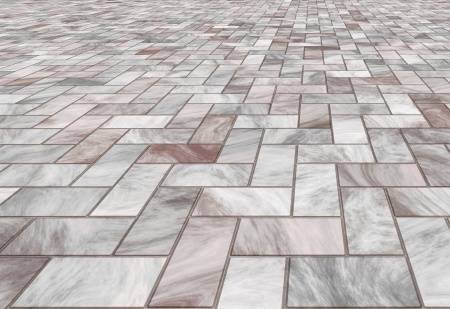 Or maybe you’ve never liked the way your tiled floors looked. Grout lines can absorb dirt, mold, mildew and bacteria. Over time this can actually erode and damage your grout. Are you tired of getting on your hands and knees scrubbing and scrubbing to get them clean? Pre-Treatment – First we apply a deep cleaning solution that loosens up the dirt, grime, oils, and bacteria. We agitate the cleaning solution into the grout lines. Pressure – We extract the dirt from the floors with controlled high pressure to penetrate the toughest areas with our special extraction tools. Heat – We use 200 + degrees of heat, leaving the surface virtually sanitized! Vacuum – Our spinning power washing tools remove the soil and dirty water off your floors and into the external waste tanks to be disposed of properly. Now that your grout lines are clean, NEW Solid Surface Cleaning can apply a sealer to your grout lines. 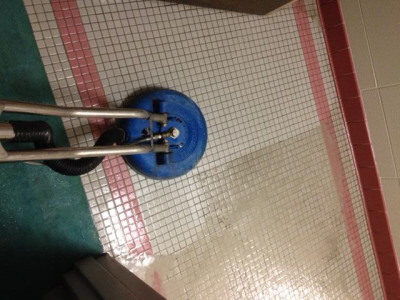 We will apply a penetrating sealer to protect and prolong the look of your grout lines. Our commercial grade sealer will provide protection for 5-7 years. Depending on your environment and foot traffic, we may need to provide maintenance cleanings periodically. We will offer tips on how to keep your floors looking their very best and extend the results of our cleaning. If you desire a different look or color to your grout lines, we can provide a colored sealer to change the appearance of your grout lines after our cleaning. NEW Solid Surface Cleaning can clean all types of stone floors including travertine, slate, marble, granite, limestone or any other type of stone you may have. It is very important to use proper methods and chemicals to clean natural stone. Improper chemicals can harm and even damage some stone floors. Don’t trust just any cleaning company to your stone floors or countertops. NEW Solid Surface Cleaning is trained and certified to clean, seal and polish stone floors, countertops and walk-in-showers.